The monster does not come walking often. This time it comes to Connor, and it asks for the one thing Connor cannot bring himself to do. Tell the truth. This is a very touching story about a boy who feels very damaged, guilty and mostly angry. He struggles at school with bullies, and pity looks from everyone, and at home with his mother's sickness. Will Connor overcome his problems? Will everything be okay? Will Connor be able to speak the truth? Conor: Your stories never made sense to me. The Monster: Because humans are complicated beasts. You believe comforting lies while knowing full well the painful truth that makes those lies necessary. In the end, Conor, it is not important what you think. It is only important what you do. Conor: So what do I do? The Monster: What you did just now. You speak the truth. The Monster: You think it's easy? You were willing to die rather than speak it. The Monster: Now all that is left is for you to speak the simplest truth of all. Conor: I don't want you to go. Mum: I know my love. The Monster: It ends with a boy holding on tight to his mother. And by doing so... he can finally let her go. Mum: ...and if you have to break things, then by God, you break them! The Monster: Stories are wild animals... if you let them loose, who knows what havoc they may wreak. The Monster: Here is the end of the tale. The Monster: Of course you are afraid. It will be hard, it will be more than hard. 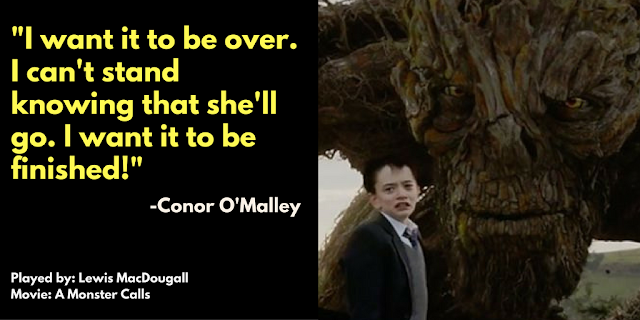 But you will make it through, Conor O'Malley. The Monster: I will be right here. Conor: [having a nightmare] Mama! Mama! Conor: [waking] How does the story begin? The Monster: It begins like so many stories. With a boy, too old to be a kid. Too young to be a man. And a nightmare. The Monster: [telling a story] "You may have the yew tree," said the person. "I will preach sermons in your favor. I will do anything if it would only save my daughters." 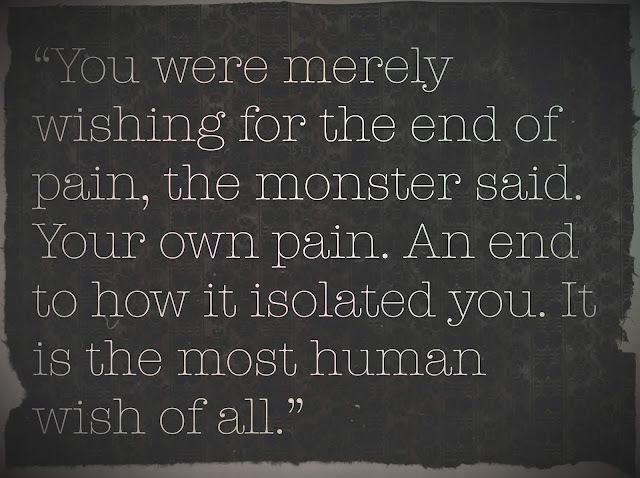 The Monster: "Would you give up everything you believed in?" said the apothecary. The Monster: [as the Parson] "If it would save them, I would give up everything." The Monster: [as the Apothecary] "Then there is nothing I can do to help you." The trailer for "A Monster Calls" arrived yesterday, and it brought all the feels. Yeah, the monster -- voiced by Liam Neeson -- looks a bit like "Groot," and a child being visited by a giant fantasy friend may remind you of "The BFG," but don't let yourself get sidetracked. This is a beautiful, touching story. 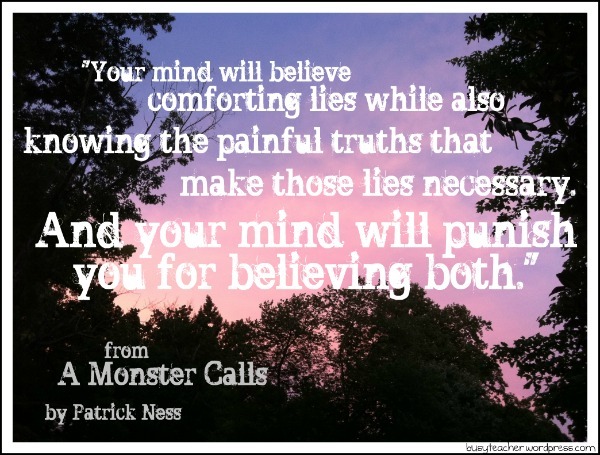 "A Monster Calls" -- starring Felicity Jones, Sigourney Weaver, Toby Kebbell, and Lewis MacDougall -- is based on the award-winning children's book by Patrick Ness, based on an idea by Siobhan Dowd, who died of cancer before she could write the fantasy novel herself. The story follows a boy named Conor (Lewis MacDougall) who struggles to cope with his mother's (Felicity Jones) terminal illness, as well as bullying at school; he begins to be visited by a monster who tries to help him by telling stories. The trailer is a visual feast, giving Conor's anger and fear great destructive powers. "It's OK that you're angry," his mother tells him. "I'm angry, too. And if you need to break things, by God you break them! ... I wish I had 100 years, 100 years I could give to you."